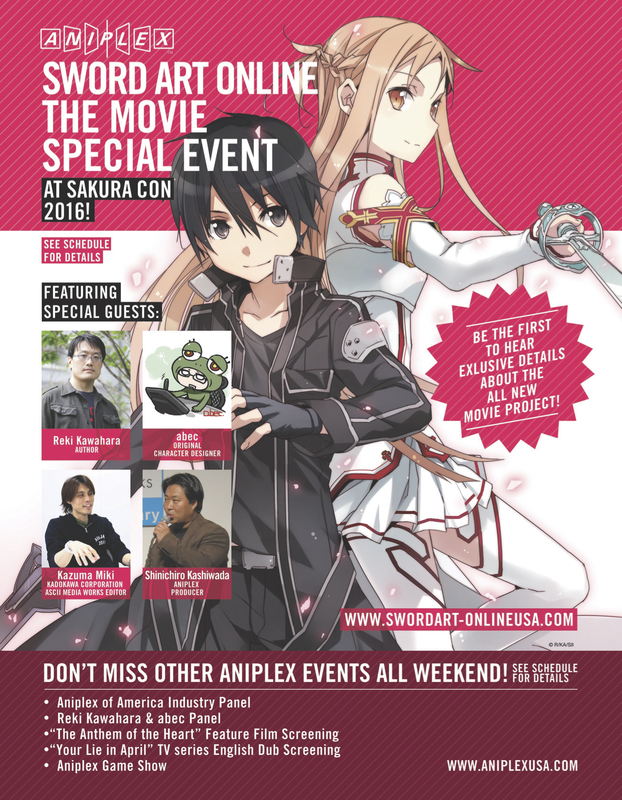 If you want to be one of the first fans to see and hear about the upcoming SAO Movie directly from some of the Japanese creative staff themselves, come to this special event only at Sakura Con 2016! That’s right SAO fan, you read that correctly! Join Reki Kawahara (Author), abec (Original Character Designer), Kazuma Miki (KADOKAWA CORPORATION ASCII Media Works Producer), and Shinichiro Kashiwada (Aniplex Producer) as they unveil exclusive details about the yet-to-be-released SAO Movie. And that’s not all—abec will be doing a live-drawing demonstration just for the Sakura Con fans during the event. You don’t want to miss this! There will be an exclusive giveaway for the fans that attend the SAO Movie Event, while supplies last. See you IRL on 3/26 (Sat) 14:00 – 16:00 at WSCC 6C! Register for Sakura-Con 2016 now. Next Sakura-Con welcomes 4 new guests with the support of Good Smile Company!